Fair Trade Colored Gemstones - Leber Jeweler Inc.
For three generations, the Leber family has been proud to offer the finest quality responsibly sourced gemstones. Working with precious colored gemstones from a number of small, community-based mining projects and privately developed sources throughout sub-Saharan Africa, Asia, and the Americas, we hand-select only the most exquisite gemological specimens to be a part of our Earthwise Jewelry® Collection. Our in-depth understanding of the science and politics behind colored gemstones makes us one of the most sought-after purveyors of rare and responsibly sourced gems on the planet. From Amethyst to Zircon, Leber Jeweler offers fine quality precious gemstones in a rainbow of colors from the most highly regarded sources in the world. We offer our primer on purchasing fine quality colored gemstones for the collector, as well as those looking to design a beautiful one-of-a-kind piece of jewelry. 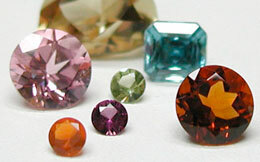 At Leber Jeweler, we are both sellers and collectors of some of the finest gem specimens available on the planet. Explore some of the finest gems past and present from our constantly evolving collection.